Jens Eckhoff is the driving force behind ihoch5, with decades of experience in banking, management, real estate, and politics. Before founding „Ihochfünf“, he was chairperson of the CDU faction in Bremen's parliament, and later was senator for construction, environment and transport in the Free Hanseatic City of Bremen for three years. A networking expert, Mr Eckhoff is president of the German Offshore Wind Energy Foundation and also a member of the supervisory boards of the Deutschen Windtechnik in Bremen. JJ Holding was founded by Jens Neumann and ihoch5 as a joint holding company in 2012. ClipVilla is currently JJ Holding's sole shareholding. There are plans however to set up further businesses and shareholdings in the new media sector. 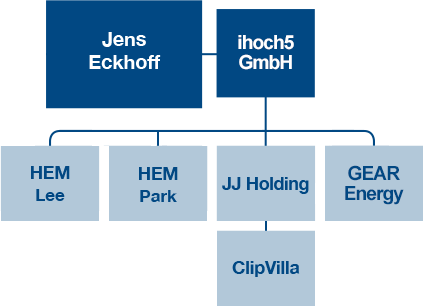 ihoch5 has a 25 percent stake in JJ Holding GmbH. ClipVilla is an intelligent portal for the creation of professional advertising videos at an unbeatable price. The web service is based on newly-developed technology which enables businesses to create within minutes a personalised advertising video from texts, photos or existing video material. The product is aimed at businesses otherwise not able to afford video advertising. E-shops and large web portals can also use ClipVilla to make product videos in large quantities at a very reasonable price. Based in Bremen, the start-up was founded in 2012. The JJ Holding GmbH has a 70 percent stake in ClipVilla GmbH. HEM Park GmbH, which runs the Bloom Café & Restaurant in Rhododendron Park in Bremen, has been a wholly owned subsidiary of ihoch5 since 1 July 2015. During the summer, guests can enjoy coffee and cake as well as a wide selection of culinary delights every day from 11 a.m. to 6 p.m. The outdoor seating area can be turned into a beer garden in summer months. Events of all kinds can also be booked at the Bloom Café & Restaurant. HEM Lee GmbH, which runs the TASTE restaurant in wpd’s new headquarters, has been a wholly owned subsidiary of ihoch5 since 1 December 2015. Guests can enjoy a quick lunch at TASTE every day. A great location makes it the right place for celebrations of any kind. Since 1 November 2016, GEAR Energy GmbH has been helping German companies chart their way into the growing market for renewables energies in the United States. Jens Eckhoff has been a regular visitor to the United States during the past six years, advising companies that are pursuing business interests in onshore and offshore wind and in photovoltaics. GEAR Energy is a wholly owned subsidiary of ihoch5.